Hoeft was placed in Class-D ball in 1950 and pitched for the Richmond (Indiana) Tigers of the Ohio-Indiana League. They could hardly have been happier with his first half-season in pro ball; he went 10-1 with a 1.71 ERA. Advanced to Triple A in 1951 and still 18 years old when the season began, Hoeft worked for the Toledo Mud Hens (American Association). There for the first time he faced some real competition. He posted an ERA of 5.76 and a won/lost record of 9-14. He made the majors in 1952, a month before he left his teenage years, and had two very good seasons with the Detroit Tigers in 1955 and 1956. Like many starting pitchers in those days, he was eventually converted into a reliever and fashioned a career that saw him through 15 seasons of big-league baseball. He worked in 505 major-league games with a career record of 97-101, and an earned run average of 3.94. He only worked in 56 minor-league games. After it was all over, Hoeft said that his greatest thrill had come not from any pitching but in the July 14, 1957, game against the Orioles at Briggs Stadium, Detroit, when he hit two home runs off Hal “Skinny” Brown.11 He hit only three in his career, all in 1957. Overall, he had a .202 batting average. Hoeft hailed from Oshkosh, Wisconsin. His paternal grandfather, an immigrant from Germany, was a farmer who married a Wisconsin woman. William Frederick (Billy) Hoeft was born on May 17, 1932 in Oshkosh. His mother was the former Lucy Schreiber, married to Emil Frederic Hoeft. At the time of the 1940 census, William was the fourth of the couple’s eight children. Emil worked as a laborer in an Oshkosh icehouse. Billy graduated from Trinity Lutheran Grammar School and Oshkosh High. A few weeks before the end of spring training in 1952 with the Tigers at Lakeland, Florida, Hoeft got the word from manager Red Rolfe: he was going to make the team. Teammate George Kell was said to have proclaimed that he looked “like another Hal Newhouser.”12 The matter of looks may have been physical as much as anything. Both Tigers pitchers had broken in as teenagers, both were listed at 180 pounds, and Hoeft at 6-feet-3 was just one inch taller than Newhouser. The Tigers formally acquired Hoeft’s contract on April 14. His major-league debut came on April 18, 1952, in Cleveland. He pitched the final two innings, allowing just a single, in a game the Indians’ Bob Feller won, 5-0. For the year Hoeft pitched in 34 games, 10 of them starts, and posted a 4.32 ERA that was marginally above his team’s 4.25 average. His won/loss record stood at 2-7 for the last-place Tigers. Fred Hutchinson had taken over as manager midway through the season. Hoeft worked for Detroit for most of the rest of the 1950s. His 1953 season saw him starting in 27 of his 29 games. He cut down on his walks and his 4.83 ERA was better than the team’s 5.25. Hoeft went 9-14 in wins and losses, although the 24 home runs he allowed would have led the league, except that teammate Ted Gray gave up 25. The Tigers finished in sixth place. The Tigers moved one rung up the standings, to fifth place, in 1954. Hoeft had another so-so year (7-15, 4.58) but he earned one distinction: he led the American League in strikeout-to-walk ratio, with 114 Ks to 59 BBs. His best game was the 8-0 two-hitter against the Yankees on June 8; he had a no-hitter going through six. It was the second time he’d shut out the Yankees in 1954; the first was a five-inning win (allowing just one hit) on May 2. And there was an oddity in his first start after that – a 10-inning complete-game shutout of the White Sox on May 9 which ended in a 0-0 tie game. Everything came together nicely for Hoeft in 1955. Before the season began, he announced a new resolve. “I had a lousy year [in 1954] because I didn’t keep myself in shape. I don’t have any excuses. It was my own fault, I let myself get soft.”15 He had put on 15 pounds during the season, and admitted regularly breaking curfew. Basically, he said he had thought about it over the winter and had matured. The Tigers as a team, however, finished fifth again. It was another fifth-place finish in 1956, even though Hoeft became a 20-game winner (20-14, 4.06). Frank Lary won 21 games for the Tigers, and between them they won fully half of the team’s wins (the Tigers finished 82-72). Hoeft struck out a career-high 172 batters in 248 innings, also a career high. There was a possibility that Hoeft would be drafted into military service in 1956, but he was ruled exempt due to some knee trouble attributable to an old football injury and an unspecified nervous disorder.17 He took another exam in mid-June 1956, and yet another in March 1957, both of which also resulted in exemption. By the time the 1958 season began, Hoeft – age 25 – was the club’s “grizzled veteran” in terms of service time. He’d been on the roster for six full seasons. With Lary, Paul Foytack, and Jim Bunning on board, Hoeft became the Tigers’ fourth starter. He started 21 games but that was a full dozen fewer than the other three. He relieved in 15 games. It is not easy for any pitcher to mix roles between starting and relieving; Hoeft’s ERA went up from the prior three seasons (4.15), but it was still within the range of his prior six seasons, as were other indicators such as WHIP (walks and hits per inning pitched) and his strikeouts-to-walks ratio. He finished the season at 10-9. 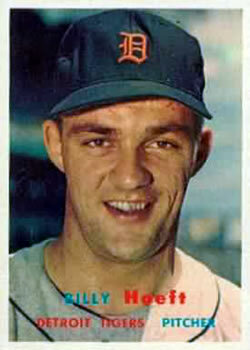 Come spring training 1959, however, Hoeft was still with the Tigers. The Huntsville Times ran a story under the headline “Tigers Hope for Comeback from Southpaw Ace Hoeft.”20 He pitched exceptionally well at the start of spring training but then came down with a sore arm that knocked him out of action for a couple of weeks. He started the seventh game of the season and pitched six scoreless innings before reliever Tom Morgan allowed two inherited runners to score in a 5-2 victory over the White Sox. Six days later, he shut out Kansas City for three innings, but was relieved with the bases loaded in the fourth. Morgan again allowed all the runners to score, tagging Hoeft with the loss. He lost each of his first three starts for the Red Sox, and then appeared in a pair of games in relief. At that point he was 0-3 with a 5.60 ERA, and the Red Sox lost patience. They traded him on to his third team of the season, the Baltimore Orioles. The June 15 trade brought left-handed pitcher Jack Harshman to Boston in what Ed Rumill of the Monitor called, “one of those ‘gamble’ deals, since neither pitcher – both left-handers – has done much of anything this spring.”22 Harshman didn’t work out any better in Boston (indeed, his contract was sold to the Cleveland Indians in the latter part of August for a reported $20,000).23 Nor did Hoeft recover in Baltimore; he went 1-1 (5.71) in 16 appearances for the Orioles. A few days after the 1960 season began, before Hoeft appeared in a big-league game, he was sent on 24-hour recall to the Miami Marlins in Triple A just to get in some innings. Baltimore brought him back on June 15. He appeared in 19 games for the Orioles, all in relief, and only for a total of 18 2/3 innings. He finished the season 2-1, with both wins coming against the Red Sox, and a 4.34 ERA. Then, suddenly it seemed, Hoeft had a very good year in 1961. He mixed starting (12 games) and relieving (23 games), worked a total of 138 innings and compiled a 2.02 ERA that was by far the best of his career, even better than closer Hoyt Wilhelm’s 2.30. Hoeft’s August 19 one-hit shutout of the Senators in Washington was the standout game of the season, marred only by a fifth-inning single that skittered past the shortstop. Hoeft went 4-8 (4.59) in 1962, but he was valuable in terms of providing some long relief when needed. There were two games in June where he worked 6 2/3 and 7 1/3 innings of relief. Though those were outliers, for the season he worked 113 2/3 innings in 57 games. Hoeft went undefeated in 1963. In December 1962, he had been traded to the San Francisco Giants as part of a six-player swap. He didn’t pitch for the Giants until June 15 due to a fall in early spring training which resulted in a badly-jammed shoulder. He appeared in 23 games, all in relief, for a total of 24 1/3 innings. He went 2-0, facing two batters in the June 28 game and three in the July 24 game, both times coming in at the right moment to become the pitcher of record just before the Giants took the lead. Unfortunately, he blew five saves, and carried a 4.44 ERA. In December 1963, he was part of a seven-player deal that made him one of the Milwaukee Braves. He was with the Giants for just under a year. Hoeft kept his undefeated streak going in 1964. That year he was 4-0, with an improved 3.80 ERA. He worked 73 1/3 innings in 42 games. The Braves finished fifth, but it had been a tight race and they finished the season only five games out of first place. Hoeft signed on with his first team again – the Tigers – in November 1964. But at the end of spring training, on April 11, they released him. He started working out with the Chicago Cubs. He went to the Salt Lake City Bees of the Pacific Coast League where, through June, he compiled a 3-7 record with a 3.07 ERA, including a June 8 complete-game seven-inning one-hitter, facing only 22 batters. On June 30 he returned to the majors, pitching for the Cubs, losing a game to the Dodgers in his first appearance despite only yielding one run in five innings of relief. He worked out to be a good addition to the Cubs, with an earned run average of 2.81 in 29 games (two starts). He pitched for the Cubs again in 1966, appearing in 36 games through July (1-2, 4.61 ERA) before being released on August 2. One week later, on August 9, the San Francisco Giants hired him to pitch batting practice. The September 1 newspapers carried news that the Giants had signed him to their regular pitching staff. He appeared in four games, for a total of 3 2/3 innings, losing both of the last two games in which he appeared despite only facing four batters in each game. They were his last two big-league ballgames. In January 1967, Hoeft took a position as a corporate service representative for Manufacturers Bank in Detroit.29 Four months later, he was pitching for a “sandlot team sponsored by a Detroit sporting goods store.”30 It was just for fun, he said, though he wasn’t ruling out a return to coaching or managing. Nonetheless, “It’s the first time in 10 years of marriage that I can stay home and enjoy my family. I enjoy being able to stay home week-ends and enjoy a ball game on television. I’m getting to know the family all over again.”31 Hoeft had married his wife, TWA flight attendant Marjorie Ekelund, on February 25, 1957. They eventually had four children, Billy Jr. (1958), Dede (1961), Eric (1965), and Terry (1968). Hoeft died on March 16, 2010 at Canadian Lakes. This biography was reviewed by Joe DeSantis and fact-checked by Alan Cohen. In addition to the sources noted in this biography, the author also accessed Billy Hoeft's player file and player questionnaire from the National Baseball Hall of Fame, the Encyclopedia of Minor League Baseball, Retrosheet.org, Baseball-Reference.com, Rod Nelson of SABR's Scouts Committee, and the SABR Minor Leagues Database, accessed online at Baseball-Reference.com. 1 Associated Press, “Wild Pitch Ends Legion Pitcher’s 34 Victory String,” Milwaukee Journal-Sentinel, August 27, 1949: 6. 2 Allen Madden, “Oshkosh Prep Ace Eyes Pro Career,” Daily Illinois State Journal (Springfield, Illinois), September 8, 1949: 22. 3 Associated Press, “Pitches No-Hitter Fanning All 27,” Columbus (Ohio) Dispatch, April 30, 1950: 53. 4 Arthur Daley, “Classifying Perfection,” New York Times, April 1, 1957: 41. 6 Margery Miller Welles, “Big Leaguer-Pitcher Billy Hoeft,” Christian Science Monitor, May 24, 1957: 19. 10 Sam Levy, “Badger Babies,” Milwaukee Journal-Sentinel, March 16, 1954: 35. Levy said that Wisconsin’s Harvey Kuenn was understood to have signed for the same amount. Kuenn and Hoeft roomed together while with the Tigers. 11 Rich Marazzi, “Billy Hoeft Was A Winning Southpaw in the 1950s-60s,” Sports Collectors Digest, January 3, 1997: 90, 91. 12 Associated Press, Carey, Yank Third Sacker, Looms As Top Rookie,” Boston Herald, March 23, 1952: 117. Another A.P. article from 1953 went into more detail about Hoeft’s pitching. See “Hoeft Looks, Throws like Hal Newhouser,” Seattle Daily Times, March 15, 1953: 44. 13 United Press, “Hoeft Heads for Stardom Says Casey; Youngster Admits Curve Needs Work,” Hartford Courant, August 9, 1953: C6. 14 Associated Press, “Hoeft Reads ‘How To Pitch,’ Then Hurls Tigers to Victory,” Boston Globe, July 30, 1954: 12. 15 Associated Press, “Hoeft Vows He’ll Behave, Improve Record This Season,” Jersey Journal (Jersey City, New Jersey), March 4, 1955: 3. 16 Grant Rainsley interview with Billy Hoeft on February 15, 2006. 17 Associated Press, “Tigers Awaiting Army’s Reports on Kuenn, Hoeft,” Arkansas Gazette (Little Rock, Arkansas), June 19, 1956: 18. 18 Jack Tighe, “Acquisition of Martin Improves Detroit Club, Declares Skipper Tighe,” Trenton Evening Times, December 24, 1957: 20. 19 UPI, “Tigers Try to Obtain Maris, Lopez,” Lexington Leader (Lexington, Kentucky), February 20, 1959: 11. 20 Huntsville Times, March 10, 1959: 9. 21 “Sox Deal Lepcio, Sisler for Hoeft,” Boston Herald, May 3, 1959: 186. 22 Ed Rumill, “Boston Club Gives Up Hoeft in Transaction,” Christian Science Monitor, June 15, 1959: 13. 23 “Harshman Deal May Win Pennant for Indians,” Boston Traveler, August 24, 1959: 12. Harshman was 5-1 for the Indians for the rest of the season but the team fell five games short of the White Sox in the race for the AL pennant. 25 Associated Press, “‘Braves Didn’t Want Flag Because of Move to Atlanta’,” Atlanta Constitution, April 1, 1965: 46. 27 Associated Press, “Hoeft, In Majors Since ‘52, Announces His Retirement,” New York Times, October 9, 1966: S2. 29 Associated Press, “Ex-Major Hoeft Hurling in Park League,” Boston Globe, May 28, 1967: 57. 34 Email to author from Grant Rainsley, December 15, 2016.